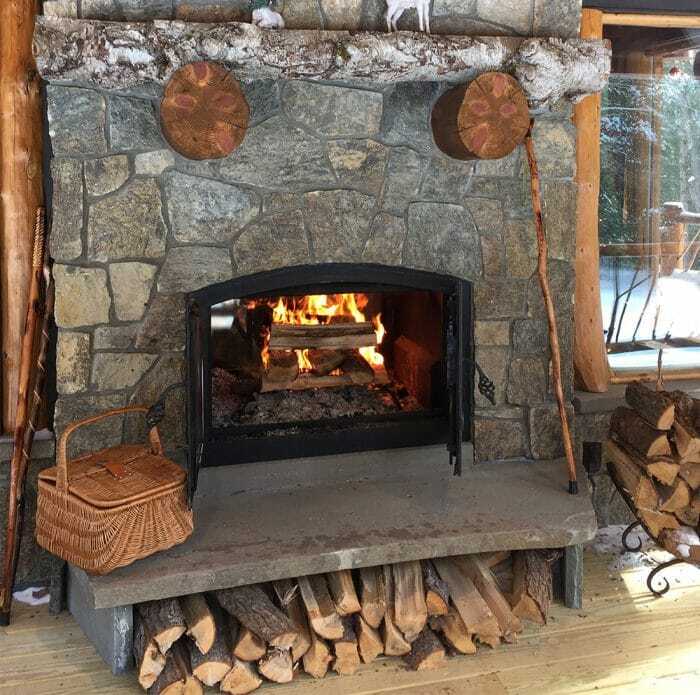 Custom Wood Fireplaces – Get Inspired! Those looking for a wood fireplace for their home are all seeking something unique: some desire heat, others wish for ambiance, and some are longing for something more. Wood fireplaces by Acucraft can be designed to give you what you seek. Acucraft custom wood fireplaces are built and designed specifically for each owner, with your style and desires as a main focus. Custom Wood Fireplaces are becoming more popular, learn more about this product that is as unique as you are! Dave Dwyer came to Acucraft seeking a heat producing wood fireplace. His future log cabin would be located in Meeker, CO which presents cold weather and frequent power outages because of its remote location. 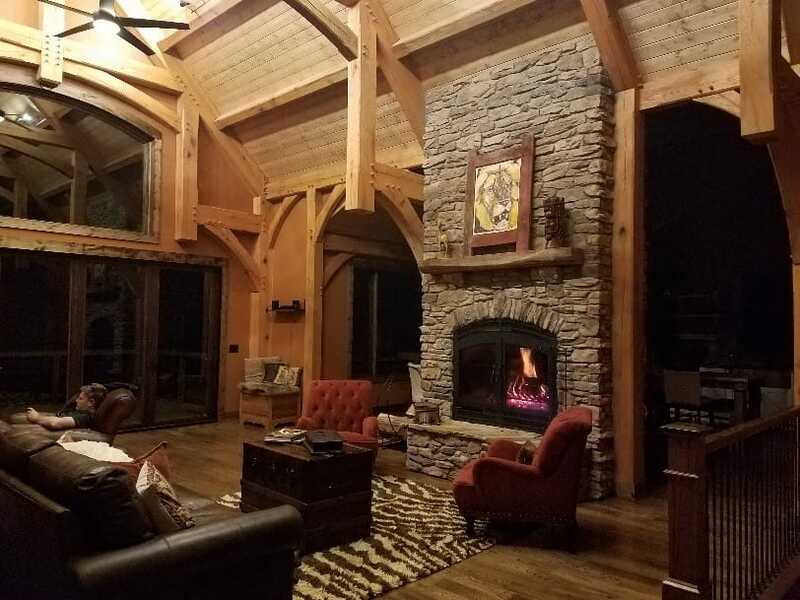 A large peninsula wood fireplace would, not only be an amazing focal point for this beautiful home, but would also heat the entire home with or without power. Ambiance is defined as the character and atmosphere of a space. A wood fireplace can also be defined as such. By creating your own unique design, you can represent your space in a wood fireplace focal point. These are just some examples of custom wood fireplace designs that we have created in the past. The see-through wood fireplace has been featured in a magazine and combined modern with rustic elements perfectly. The peninsula wood fireplace is the focal point in an ultra-modern home. And the circular indoor wood fire pit is in a palace in Qatar that features beautiful and unique curved architecture. Wallis Construction was searching for an all-purpose wood fireplace for a new smokehouse restaurant in Austin, TX. This fireplace was designed to mirror the rustic surrounding of the Sausage & Beer Garden restaurant. Not only is this fireplace to be used for ambiance, it is engineered to be completely open to be used for smoking and cooking in the smokehouse! Acucraft offers a wide variety of cooking accessories made using kitchen-grade stainless steel: BBQ Grills, Cooking Arms, and more! When you work with Acucraft, you can be certain you are only getting the highest standards in quality when it comes to materials, design, and craftsmanship. Whatever fireplace dreams you have; our limitless customization can make a reality. Learn more about creating your own custom wood fireplace; work one-on-one with a Fireplace Advisor today! Since 1979, Acucraft has been your wood burning experts and premier wood fireplace manufacturer. Acucraft released the Wood Burning Fireplace Catalog in February, 2018, showcasing custom and multi-sided wood fireplaces. This all-encompassing catalog includes all Acucraft’s popular fireplaces complete with specifications, photos, and customization options. If you are seeking a wood fireplace to heat your home, or just to provide ambiance, Acucraft has the solution. Here is a preview of all the Wood Fireplace Catalog has to offer! Acucraft’s best selling wood fireplace series: the Hearthroom! The Hearthroom delivers a classic, rustic look that fits perfectly in a log cabin, traditional home, or even alongside modern finishes. This unit boasts a max 80,000 BTU output and can heat nearly 2,000 square feet. Available in 36”, 44”, or 48” sizes and single-sided, see-through, or indoor/outdoor styles. Many customization options are available! Similar to the Hearthroom, the Unity series offers the heat of the Hearthroom but with no grills above or below the doors. This clean-faced fireplace offers ducting that can relocate the heat output to any room in your home. This unique fireplace is available in 36”, 44”, or 48” sizes and single-sided, see-through, or indoor/outdoor styles. Many customization options are available to create a fireplace that is truly your own! 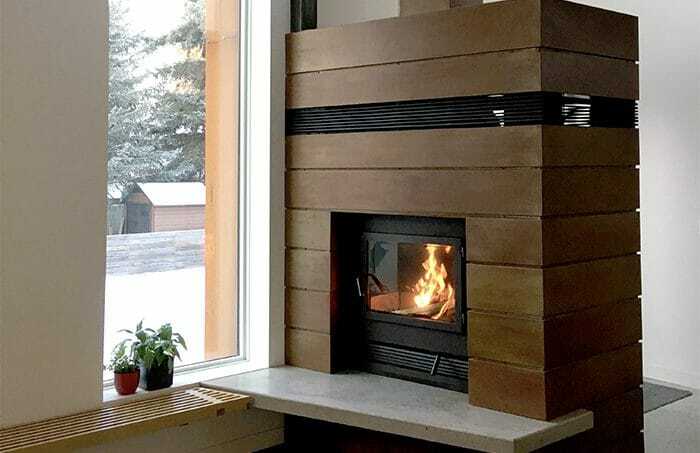 The High-Technology Wood Fireplace Series by Acucraft includes four fireplace models: the Z-MAX, Chalet, Chalet See-Through, and the Great Room. These are Acucraft’s legacy products and are built to give you the ultimate wood burning experience. They can heat up to 4,000 square feet with a maximum BTU output of 180,000! All (excluding the Z-MAX) can be made to accommodate a Masonry installation. Customization options are available for these fireplaces! Seeking something that brings shock and awe to your space? Or are you seeking something that is just a little bit more “you”? All Acucraft custom wood fireplaces are built and designed specifically for each owner, with your personality and style as a main focus. Create a modern fireplace aesthetic or a zero clearance fireplace with the look and feel of a masonry. You can be certain that you are only getting the highest standards in quality when it comes to materials, design, and craftsmanship. Acucraft offers many customization options so you are able to create a fireplace that matches your style and personality. Pick a finish that reflects your d√©cor. Front and door options are available in either arch or rectangular styles. Grid and handle options can change a rustic fireplace to a modern fireplace. Looking to heat your entire home? Acucraft offers Whole Home Heating to all wood fireplaces. Utilize your wood fireplace with Acucraft’s cooking options. You can even operate your fireplace without doors and with full safety by using a custom-built fire screen. Enjoy traditional ambiance with the Hearthroom series. Embrace the clean, modern aesthetic of Acucraft’s Unity series. Heat your home with a High-Technology fireplace. Or, create something truly unique with a completely custom creation. Discover which fireplace best defines you and your space. When you work with Acucraft, you work one-on-one with your personal Fireplace Advisor. Request Acucraft’s Wood Burning Fireplace Catalog today! The Signature Series is built for simple installation and made for customization, making it ideal for residential properties. Homeowners will love the flexibility and options these fireplaces offer. This Residential Series brings you all the popular options. Connect spaces with the see-through. Bring the tallest flames inside and out with the indoor/outdoor. Embrace the fire with the optional open style, previously only available in custom products! A new conversion kit by Acucraft is also available to easily convert your fireplace to open with a fire screen or glass with functioning glass cooling whenever you’d like! Popular sizes to accommodate any space. From moderate to impressive, you can create the ultimate focal point and conversation piece. 4 foot wide to 8 foot wide viewing areas are perfect for any residential home. Customization options are available to personalize your fireplace. Perfectly match the style and flare your home currently boasts. From glass, to stone, to log sets, and LED lighting; you can mirror your personality in your fireplace. Acucraft worked hard to design a fireplace that would be simple and safe to install with options to make it perfect for any location in your home. Flexible installation means you can choose the Signature’s intake to come from the side or the bottom of the fireplace. The Signature is a zero-clearance fireplace; it can be placed on any non-combustible surface. Never worry about special framing or assembling the firebox. And don’t sacrifice the modern, clean look of your fireplace with unsightly vents and access panels. At Acucraft, you work one-on-one with your own personal Fireplace Advisor to ensure we are crafting the fireplace of your dreams. Learn More About the Signature Series and Request Your Brochure Today! Executive Affiliates, Inc. came to us while working on the Prairie Winds Apartment project. Prairie Winds of St. Charles, a rental community, was designed and built to be the new premier apartment complex in Illinois. Prairie Winds offers 1, 2, and 3-bedroom apartments with high-end finishes: stainless steel appliances, granite countertops, open-concept floor plans, and attached garages. In order to mirror these amenities throughout the apartments, Executive Affiliates asked Acucraft to create a truly unique fire feature for the new building’s lobby. To keep in sync with the open-concept within the apartments, the fire feature they sought would need to be seen throughout the lobby but also not intercept the view. The Infinity6 Dual fit the bill: 4 sides of clean, glass-on-glass with no support, modern design with media and glass cooling, and a combination of 2 connected burners to create the tallest and fullest flames on the market. This 4-sided gas fireplace is crafted for safety and is made with commercial-grade components. The ultra-modern design is perfect for this amenity-driven apartment complex. Prairie Winds Apartment, located in St. Charles, is set between multiple ponds and a beautiful wetland. Although the luxury apartments are located within walking distance to popular bars and restaurants, you don’t have to go far to get something to eat! Prairie Winds offers a free juice and coffee, a world-class fitness center, heated pool with locker room, and more! The Infinity6 Dual Fireplace fits perfectly in the lobby near the apartment Caf√©. Enjoy your coffee and snacks with a view of majestic flames no matter where you sit in the lobby. Prairie Winds Amenitites Include World-Class Gym, Heated Pool, 4-Sided Fireplace, & More! Executive Affiliates did great work on the Prairie Winds Apartment. They captured the high-end features they were going for and created an amenity-filled apartment complex that will please the most discerning tenant. A gorgeous Acucraft fireplace greets you with the tallest flames on the market that are sure to leave an impression. When you work with Acucraft on any project, you work one-on-one with your own Fireplace Advisor that will create your dream fire feature.